Troublemakers were into action on the 5th of June, 2018 at the hills near Badi Lake. 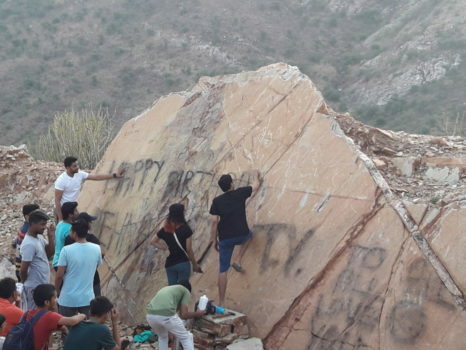 A group of people spray painted rocks on hillsides near Badi Lake at Udaipur, with messages that created an unwarranted agony to the beauty of the natural surroundings in the area. The photos of the dirtied rocks were highlighted on Instagram, by Himanshu Porwal, a resident of Udaipur on the same day. A couple of days later, on June 7, Devika Sisodia, a freelance writer, poetess and voice over artist from Udaipur, took up the initiative to clean off the paint from the dirtied rocks. Through the support of various social handles like Udaipur Vibes, Events in Udaipur, etc., around 20 people formed a group and went there early morning on the 9th of June with thinner, clothes, scrubbers and surface cleaners and cleaned the polluted rocks. Some of the volunteers with Devika Sisodia in the clean-up drive were members of Udaipur Vibes team (Ayush Vyas, Nayan Pancholi) and others were Gazal Jain, Saurabh Patwari, Aayush Devpura, Sanjit Chohan, Shubham Kothari, Shubham Dangi, Shubham, Himanshu, Parth, and many others who restored the place. These guys did a commendable job and we need more like them. If you want to make such contributions to our beautiful city then you can use the hash tag #cleanvibesofudaipur to highlight places that need cleaning which can be done easily by the contribution of youth. It is a drive to bring awareness among the people to become responsible and be the change makers & make Udaipur a smart city actually. Let’s act together and be the change that we all want to bring.